I ordered my car from Dryer and Reinbold Infiniti in Indianapolis. After three different test drives over the period of a year, the dealer accepted my offer via phone on Monday, September 8, 2003. My car arrived on Wednesday, Nov 19 and my wife and I drove to Indy to pick it up the following Saturday, Nov 22, 2003. It’s since been the most reliable car I’ve owned and the one in which I’ve driven the most miles. 10-Sept-2004 – 14,563 miles (warranty): The DVD Navigation system was replaced because it was having problems reading the disc and displayed a disc read error. Fault Code PID P0455 – EVAP System Leak Detected (large leak) – ~130,000 miles: despite many people thinking this is a large leak in the intake manifold or throttle assembly, it is not. It’s actually a failure with the Vapor Canister Purge Valve on the fuel tank. This valve is a common failure for Nissan and Infiniti vehicles. I ordered the replacement part from Amazon.com: Dorman 911-503 Vapor Canister Purge Valve for about $40. It’s extremely easy to replace. There is a flap underneath the car, in the plastic underbody cladding. It’s on the passenger side of the car, toward the back, under the car, a few feet below the fuel fill door. To replace the valve, open the flap in the plastic under body panel, find the valve, disconnect the wiring harness, twist the valve 180 degrees counter-clockwise, and pull out. Insert the new valve, twist it 180 degrees to tighten it, connect the wiring harness, close the plastic access flap, done. Fault Code PID P1273 – Air Fuel Ratio (A/F) Sensor 1 Lean Shift Monitoring Bank 1 – ~120,000 miles: this code indicates that there is a problem with the passenger-side upstream Oxygen Sensor (also known as O2 sensor or Air/Fuel ratio sensor.) This is similar to P1283, which is for the driver-side upstream Oxygen Sensor. These faults indicate that there is a problem with one or both of these sensors being out-of-range and/or not matching one other. In my experience, it’s best to replace both of these sensors if there is a fault with either one of them. Please note that these are the upstream oxygen sensors, which are located between the engine and catalytic converters, in the down-pipe coming off of the exhaust manifold. The downstream oxygen sensors are after the catalytic converters and do not cause these fault codes – the downstream sensors are only for detecting issues with the catalytic converter. The sensors are a bit difficult to access, the car needs to be on jack stands/a lift/ramps. But the most difficult part is finding the wiring connectors on the top left and right side of the engine, disconnecting them, and reinstalling the new sensor harness connectors. Dis-assembly of the air intake plumbing is required. It seems like I have to tweak about everything I buy, at least a little bit. Here’s my modification list. G35Driver.com – website and forum devoted specifically to the G35 Sedan and Coupe. Forums are sub-divided more than FreshAlloy forums, making answers and topics easier to find. Infiniti Tech Info – For $20, get a one-day pass to download the current service manuals for your Nissan or Infiniti vehicle in PDF format. Grubbs Infiniti – Great dealer for online parts ordering. Located in DFW, Texas. InfinitiPartsUSA.com – Best source for finding the exact OEM replacement parts for your Infiniti. Never checked the other parts of your blog, didn’t know you had one of these. I had an 03 coupe for 2 years but got rid of it when I moved to the city and didn’t need a car (plus I didn’t want to get it banged up). I drove the 4 door on loaner a few times, I liked it a lot especially the 4 wheel drive one. I definitely had to take mine in more than a few times, but it was always the same two things pretty much, the 6 disc changer would eat the cds and the window motors would break. 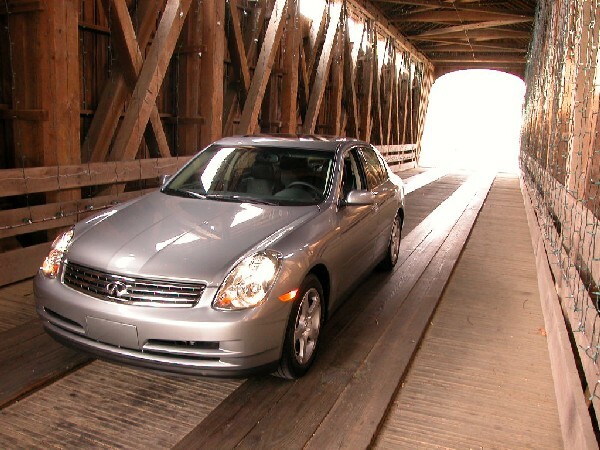 Other than those two small hi-cups a great car – do you still own the sedan? Yeah, I still have my G35 Sedan and I’m still loving it. It’s my daily driver and it has about 70k miles on it — and still no additional problems. The revised 2007 model is a beautiful car, but I don’t see any need to get trade-up from the one I have right now. I’m very happy with it. That’s a nice car. click my name for a place to get the parts you need for your mods.